As a Police Officer on Freeway Patrol I come across some funny illegal plates. 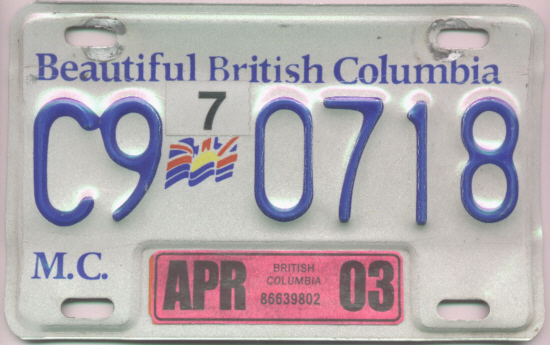 In British Columbia vehicles must be both be registered and insured through the Insurance Corporation of British Columbia (I.C.B.C.). Currently the cost of full annual insurance with a 40% safe drivers discount is around $1,000.00. The proof of insurance is provided through the serialised decal and supporting insurance documents. As always there are those people who want to circumvent the inconvenience of shelling out big money by stealing a plate or decal, altering a decal, or manufacturing their own. 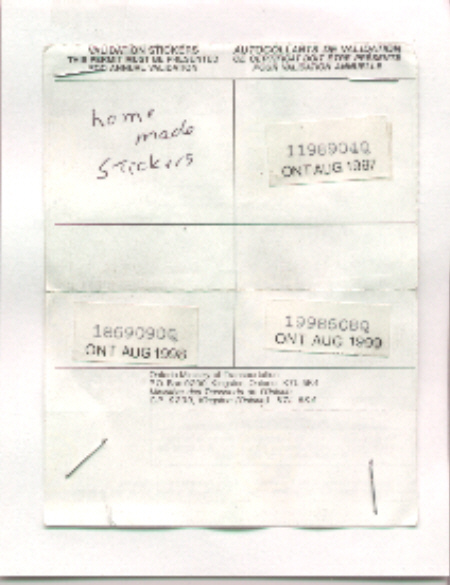 Below are some prime examples of manufactured and altered decals. 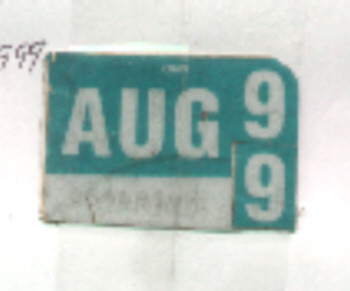 This 1996 decal was computer manufactured, printed on a laser printer, and then laminated. Because it was so easy to manufacture these black on white decals I.C.B.C. changed mid year to a pink on white decal. This decal was manufactured by exquisitely cutting out pieces of blue reflective plastic and painstakingly arranging them onto the plate. Unable to produce the minutely small serial numbers and "British Columbia" they artiste fudged around this area. The reflective qualities of the plate shone through the bare areas of the decal giving it a genuine appearance. A sloppy job of painting over a 1997 GRN on WHI decal to make it a BLU on WHI 1999 decal. The paint is too dense and doesn't reflect at night. A computer generated and colour bubble jet printed 1998 RED on WHI decal. 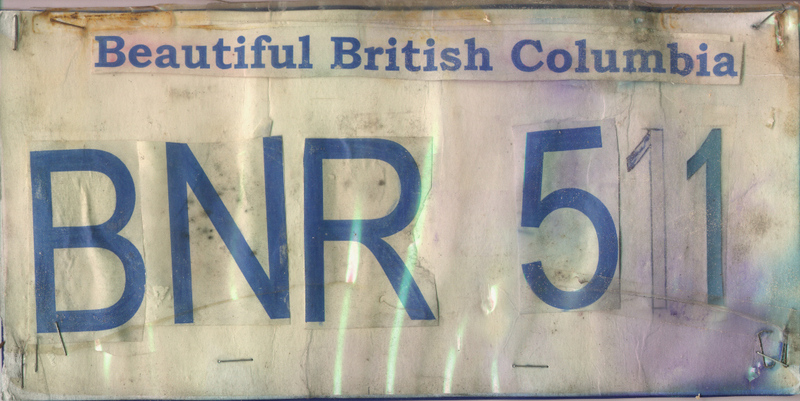 The colours are off a little and the manufacturer didn't centre the two lines of British Columbia. How do you turn a red 1998 decal into a blue 1999 decal? Easy you get some cheap blue paint and slop away...very convincing. This is perhaps my favourite amateur forgery. My attention was immediately drawn to a beater of a van. 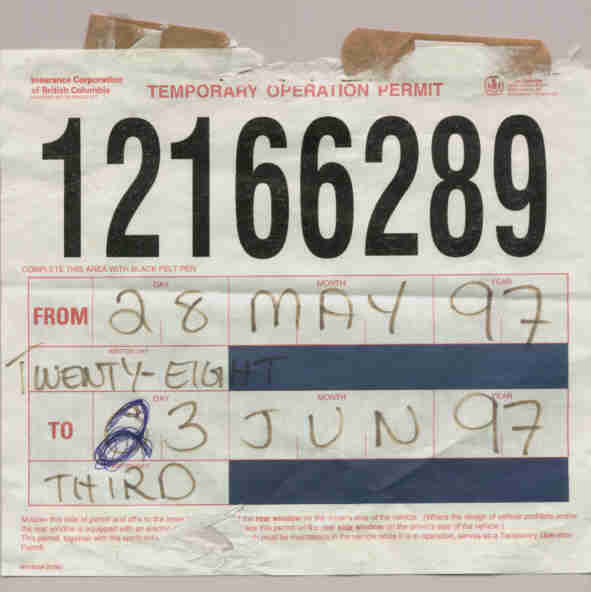 The temporary permit was affixed to the back window with Band Aids, and the expiry date was crudely changed with a blue ball point pen. This driver received about $1,000 in fines, a 30 day vehicle impound, seven days in jail, and a six month driving suspension. Ontario decals show even years on the right side of the decal and odd years on the left side of the decal. One bright spark decided to change his 1996 decal into a 1999 decal by clipping out the number 6 and inverting it into a nine. Too bad he didn't place the odd year on the other side of the decal though. He did a little better, though, when he manufactured stickers for his registration on his home computer. 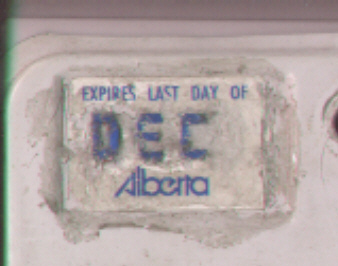 but it didn't fool the onboard computer that said the plate had expired in June. 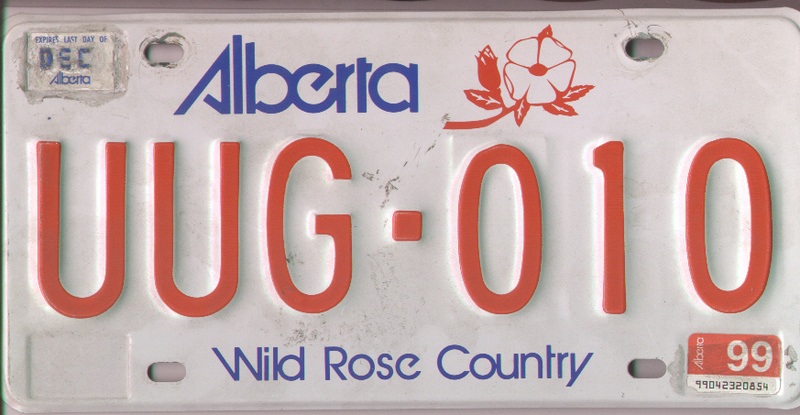 The first Albertan I've ever stopped who had tampered with his plate. He made some papier-mache, designed it into a DEC, painted it blue and covered it with silicone gel to make it waterproof. A good effort to save the $54 plate fee, but it ended up costing him $800 in fines, a $70 tow bill, and loss of a plate. The funniest one ever. Unfortunately I wasn't the officer who stopped this miscreant with a poorly designed home made B.C. plate. an authentic decal scanned into a computer and reproduced quite well on a printer.